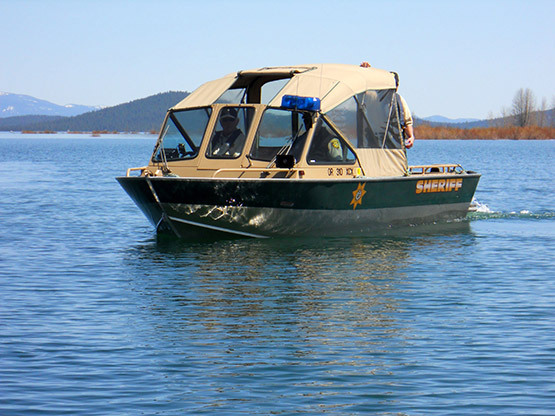 The Deschutes County Sheriff’s Office, in conjunction with the Oregon State Marine Board, has established the following dates in 2016 to assist boaters in obtaining their Mandatory Boater Education card. Those seeking their card need only attend one three-hour session, not all of them. The Mandatory Boater Education law, passed by the 1999 Oregon Legislature, requires ALL Oregon resident boat operators of powerboats greater than 10 horsepower (including personal watercraft) and youths 12-15 operating ANY size powerboat, to take a course on basic boating skills and pass a written test to demonstrate basic boating knowledge. Upon passing a written test or approved course of instruction, the boater can apply for a boater education card which must be carried when operating a powerboat on Oregon waters. This class is not intended for first-time boaters; those taking this class should have some previous boating experience, and should study the “Boat Oregon” study guide. Those guides are available free at the main Sheriff’s Office in Bend, any of the Sheriff’s Office substations in Terrebonne, Sisters or La Pine, and at All Seasons RV & Marine and Central Lake Marine in Bend. A more comprehensive 8-10 hour course for first-time boaters MAY be scheduled later in the summer if there is enough interest. There is no charge for this class; students watch a video, have a short Q & A session and then take a 70 question multiple-choice answer test. Students who receive a 70% or better score on the test will be provided with the necessary paperwork to get their card, which costs $10 from the Marine Board. This is a one-time fee…the card is not a license, does not need to be renewed and is good for life. Many insurance companies offer a slight discount on boat insurance rates (when insurance may be required, as when financing a boat), for those who successfully obtain their cards.